Thank you very much for your letter, dated April 10, 2009. I do often receive letters such as your own, so please forgive me if I provide my pat answers to your questions. There are, as you can imagine, many many children with questions such as your own. Your first question is apparently, of high concern among children, particularly children from Western countries like the United States of America. I am curious about this. Are you, somehow, insecure about whether or not you have behaved naughtily throughout the past year? Do you fear that you, somehow, deserve rocks in your Easter Basket? I, in fact, do not deliver rocks to naughty children. Even us bunnies realize that all children are both naughty and nice to varying degrees at different times. Furthermore, such behavior is often precipitated by choices made by the parents. Did you ever, as an example, read the book Charlie and the Chocolate Factory? Do you remember the character Veruca Salt? Veruca, the only daughter of the wealthy Henry and Angina Salt, regularly exerts petulant behavior in order to get what she desires. When Veruca demands that she must have a Golden Ticket, her father buys numerous cases of Wonka Bars, and orders his factory workers to put aside their regular duties of peanut-shelling and unwrap the bars. The process lasts three days, all of which Veruca spends complaining that she doesn't have her ticket. When the ticket is finally found, Veruca is "all smiles again." Her father later confesses to Wonka that he knows his daughter is "a bit of a frump." So you can see, even spoiled little boys and girls deserve a chocolate on Easter. You can decipher for yourself if I find you and your brother to be naughty or nice. Do bunnies like carrots? Indeed, we do enjoy carrots. The story of Peter Rabbit and his trials and tribulations with Farmer McGregor were all true. We risk life and limb to acquire the tasty delicacies of fresh fruits and vegetables from people’s gardens. If only we were served or had the means to pay for such vegetables at the upscale groceries that cater to humans like yourself. Alas. Why do humans dye eggs? Why is Easter in spring? Did Jesus die and rise again? Why are you the symbol of Easter? Did they have the seasons back then? I put all of these questions together because they are inextricably linked. The Easter Bunny as a symbol has its origins in Alsace Germany where it was first mentioned in German writings as early as the 1600s. Why rabbits though? Well, rabbits are symbols of fertility (ask your parents what that means) from a long long time ago. 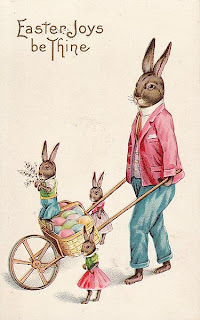 Since birds lay eggs and rabbits give birth to a large number of babies at one time in the early spring, these (both eggs and bunnies) became symbols of the rising fertility of the earth at the Vernal Equinox (this just means the beginning of spring). So you can see, your questions are perfectly related as Easter, bunnies, eggs, renewal and the changing of the seasons are all intertwined. Bunnies, then were symbols of spring when the celebrations were very different sorts of celebrations than they are now with, as you said, a link to the death and rise of Jesus. The celebration of spring was and still is, for some, what is known as a Pagan holiday – that is one without explicit religious connotations. People around the world, for all times have created celebrations around the changing of the seasons. In the fall, people celebrated the harvest and the beginning of winter, with days getting shorter and the cold weather and lack of abundant food. As spring comes, people celebrate rejuvenation, and life, and abundance. The ancient Saxons celebrated the return of spring with an uproarious festival commemorating their goddess of offspring and of springtime, Eostre. So, now, on to eggs. Eggs, too, are a celebration of fertility that is quite separate from the life and death of Jesus. The precise origin of the ancient custom of coloring eggs is not known. Many eastern Christians to this day typically dye their Easter eggs red, the color of blood, in recognition of the renewal of life in springtime. Some also used the color green, in honor of the new foliage emerging after the long dead time of winter. As for your question about Jesus. I cannot, unfortunately, answer this for you as it is a personal question of your faith and beliefs. As for my life before obtaining this post as the Official Easter Bunny. I was born of meager means in the southern tip of Albania in a small town outside of Saranda near the Greek island of Corfu on the Ionian Sea, in the late Twentieth Century. I studied hard at school and was quite diligent in my duties at home in my community. I never expected to be assigned to this post as an adult, but am very grateful for the opportunity. It is an arduous task with long hours, particularly in the months of February, March and April, but, certainly, when I receive letters such as yours, the rewards are immeasurable. I will pass on this post in two years time and go back to my life with my family (I have approximately 1,326 children of varying ages).